A ‘just transition’ for workers and communities as the world’s economy responds to climate change was included as part of the 2015 Paris Agreement on climate change. 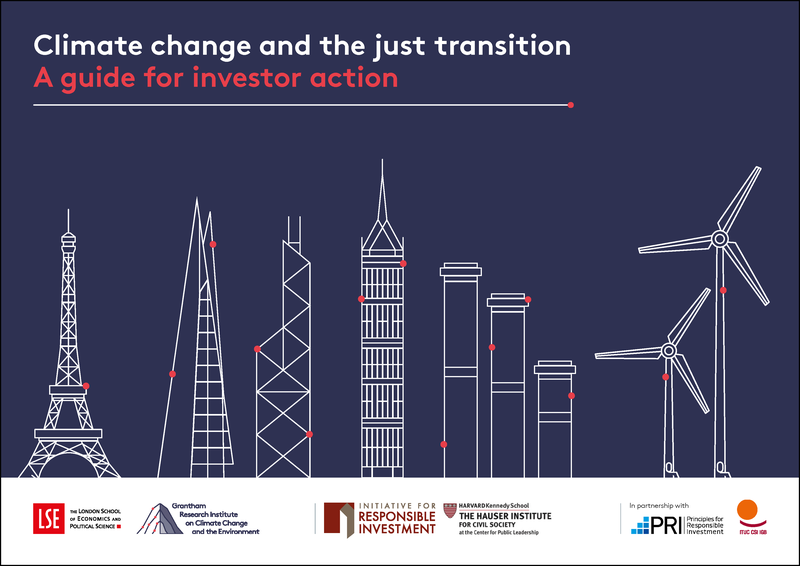 This guide sets out how investors can address the social dimension of climate change and pursue the goal of a just transition as part of their core operating practices. The guide draws on an international review of well-tested investor approaches that already exist, and on extensive dialogue with investors, to provide a framework that can be applied both by individual institutions and through collaborative initiatives. The transition to a low-carbon economy will boost prosperity but there will be transitional challenges, for workers, communities and countries. To address the challenges, investor strategies to tackle climate change need to incorporate the full range of environmental, social and governance (ESG) dimensions of responsible investment. 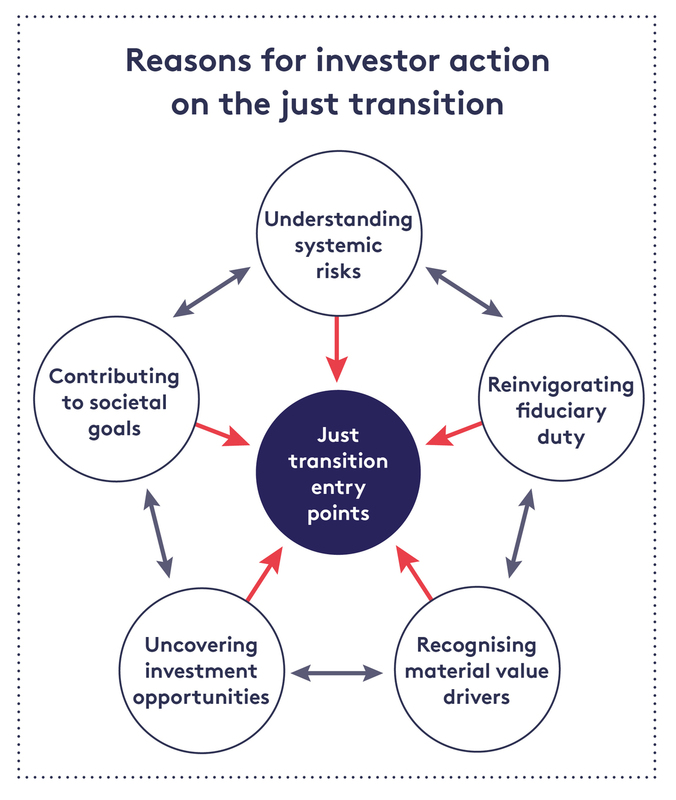 The case for investor action rests on five strategic motivations: understanding systemic risks from climate change, reinvigorating fiduciary duty, recognising material value drivers, uncovering investment opportunities, and contributing to societal goals. 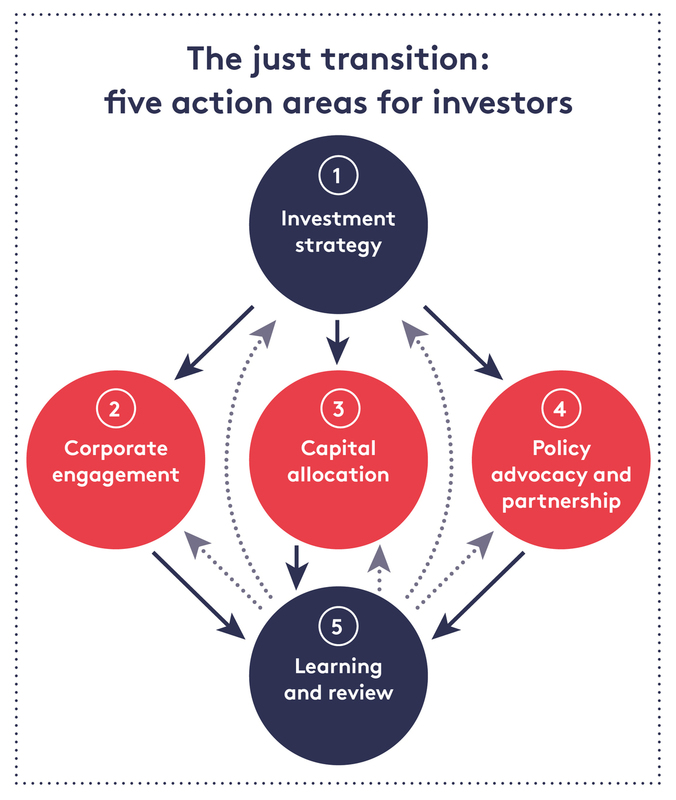 There are five areas for action based on the above motivations: investment strategy, corporate engagement, capital allocation, policy advocacy and partnerships, and learning and review. In December 2018 institutions with over US$4.4 trillion in assets under management expressed commitment to take action by signing an international investor statement. Next steps for investors include: incorporating the just transition into policy on responsible investment and climate change; integrating it into procurement of investment services; engaging with companies to include the just transition within climate strategies; channelling capital into community renewal and regional diversification; and promoting disclosure by companies, asset owners and asset managers, using the TCFD framework. 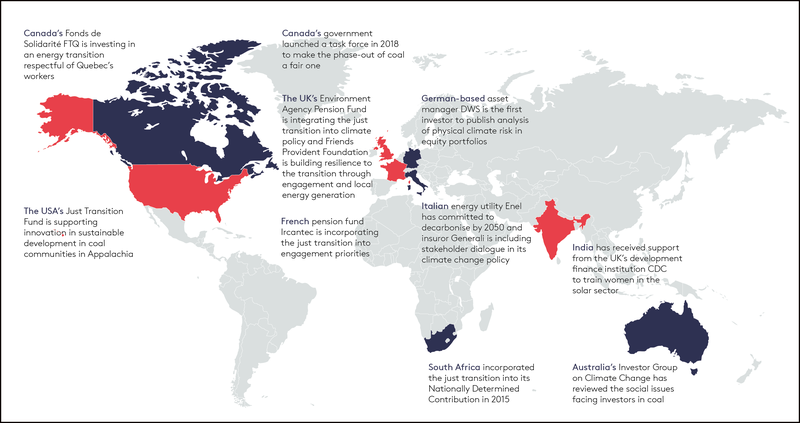 The Investing in a Just Transition initiative is led by the Grantham Research Institute on Climate Change and the Environment and the Initiative for Responsible Investment. It is being delivered in partnership with the Principles for Responsible Investment (PRI) and the International Trade Union Confederation (ITUC). 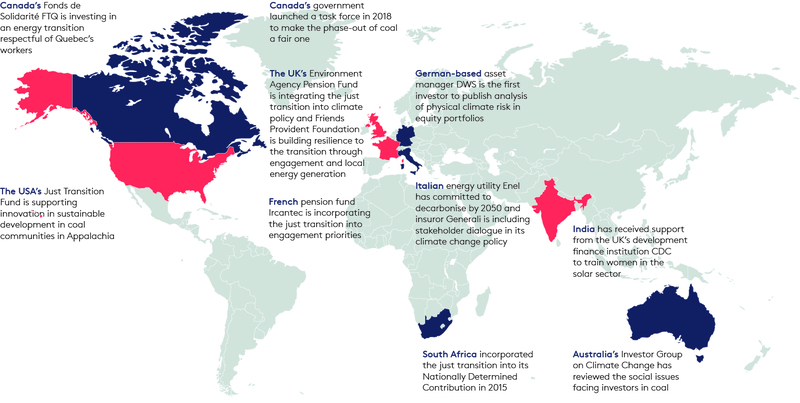 The initiative is working to identify the role that institutional investors can play in connecting their action on climate change with inclusive development pathways. This builds on the commitment within the Paris Agreement to support a just transition.